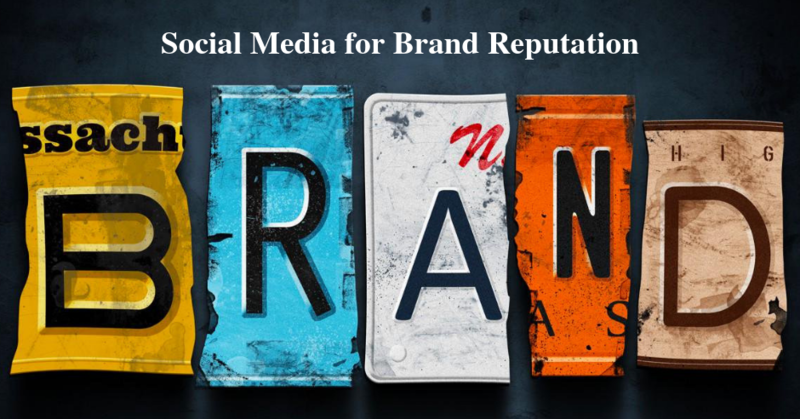 How Can You Use Social Media for Brand Reputation? We live in a world where our lives begin and end with social media. The vibrant Instagram feed and hilarious YouTube videos always have our attention. So, what if I say that you can use social media for brand reputation? That you could get the ultimate brand awareness and better connectivity with your customers. That you can absolutely increase your Return On Investment (ROI). Yes! I am not kidding. But, why social media? Why should I give it a shot? Why should I include social media in my marketing strategy? Because it is everywhere. It is powerful, unavoidable, and promises to stay. Social media is awe-inspiring and intimidating to make things done right. Make sure your business has its presence in all social media channels. Facebook, Instagram, LinkedIn, YouTube, Twitter, Pinterest, Snapchat etc. However, you must remember the fact that not every channel has the same habit of hitting the bull’s eye. And not every channel is going to help you. Instagram is widely used by teens and millennial’s almost every single day. Facebook is mostly used by adults. YouTube is everyone’s home. Kids use it for classes and homework, geeks use it for tech stuff, women use it for everything though. LinkedIn is popular for working professionals. Likewise, there are hundreds of social networking platforms with unique purposes. But you must know about your product or service and where your end audience is. Any social media marketing agency could help you with this. For instance, if yours is an e-commerce business, LinkedIn might not be an appropriate choice. Say, if yours is an online teaching platform, LinkedIn must be in your catalog. Am I in my senses? Oh, yeah! Infusing humor into marketing and advertising perfectly works. Because humor helps in making an emotional connection with the customers. People love sharing laughter. It creates a long-lasting relationship with the customers and makes your campaigns more shareable. Make sure you integrate humor into your words that grab the audience attention, entertain your followers, and increase the engagement. Every industry can come up with amusing content. For even better engagement and instant attention, you should include the prevalent trends. For which you have to be up-to-date. For instance, this is the season of IPL. Take advantage of this and come up with unique images and content that must be in tune with all ages of people, since Cricket is loved by everyone. The greatest advantage of social media is that you can build long-lasting and meaningful relationships with your customers from wherever you are. And those relationships can only be achieved by two-way communication. Many brands have adopted social media but limited their association. To remain alive and sustain well in the social media world, you have to be social. Someone has commented on your post or dropped a review for your business, that’s amazing! Respond to your audience, solve their queries, and reply to their comments without fail. Never be in an assumption that it is a time-taking process; believe that this is a process that pays you off in the long-run. The more responsive you are, the more likely you are going to be approached. Doing this does not only help you in building an authentic network but also impact your online reputation management. And the other way around should also be true; i.e., you should write the right content to the image posted. One of the effective ways s to make your presence in the market is to have visual-rich content in your store. According to a recent study, it is known that with the inclusion of images, the interaction rate on Facebook has been increased by 85% and shares by 35%. A human brain can understand or process images 60000 times faster than a plain text. Mind you, when I mean image, it should not just be a promotional image created with Photoshop or other tools. A video, GIF, and a meme will anytime draw the eye of the audience. Great! But, you must be sure of the image or graphics you are posting. Anything you post must resonate with the point you are trying to make. When we talk about today’s social media for brand reputation, leveraging influencers is a must. In other words, it is known as influencer marketing. In layman terms, it is one kind of advertising with the help of social media influencer. A social media influencer is the one who promotes a product/service through social channels. Influencers could be bloggers, journalists, celebrities, internet stars etcetera. They all have a huge following in the digital media thus brands approach them to promote theirs too. It works because it develops trust and often works as a word-of-mouth marketing. The public tends to believe the product since it is promoted by their favorite person. Why do you think brands approach big-celebrities for advertising rather than common people? Because they could make an impact. They have the potential to make a difference. Publish a rich and effective content in your social media channels is a basic thing, but it not only the part of the equation. In order to be a voice that you want people to speak in, you gotta speak in the voice they all love. Influencer marketing, a chunk of the social media marketing helps in reaching the audience faster and better. Social media is a constantly evoking landscape. Be authentic, dynamic, and consistent in order to build a brand reputation. If done correctly, any business could transform as a brand with the help of social media. A happy-go-lucky girl with 30 sweet teeth, I am just another accidental writer, social media enthusiast, and an occasional stylist. When I am not in any of these shoes, you can find me binge-watching Game of Thrones or F.R.I.E.N.D.S. My hobbies are breakfast, brunch, lunch, snacks, and supper.